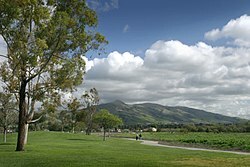 A view of Mission Peak from Fremont Central Park in 2006. </div>Location of Fremont in Alameda County, California. 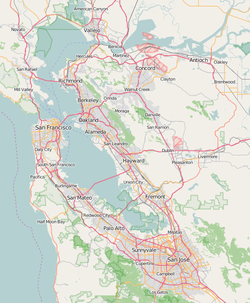 Fremont ( /ˈfriːmɒnt/ FREE-mont) is a city in Alameda County, California, United States. It was incorporated on January 23, 1956, from the annexing of Centerville, Niles, Irvington, Mission San José, and Warm Springs. The city is named after John C. Frémont, an American explorer and former US Senator from California, Governor from Arizona, Major General in the Union Army,and the first Republican presidential candidate in 1856. Fremont is home to the largest population of Afghanis anywhere on earth outside of Afghanistan, and the largest population of Afghan-Americans in the United States. Nestled between the East Bay rolling hills and the San Francisco Bay were five small, independent towns—Centerville, Niles, Irvington, Mission San José, and Warm Springs. These towns were annexed into a single new, incorporated city called Fremont in 1956. Six decades later, these places have greatly expanded, are no longer separate communities, and are considered districts or community plan areas of the City of Fremont. The town of Newark was originally slated to join the annex but ultimately its voters declined; Newark becaome its own incorporated city in 1955. Since incorporation, Fremont has created six more districts, which it calls "community plan areas" for planning purposes. These include Central, North Fremont, South Fremont, and Bayside. The two other districts, Baylands and the Hill Areas, are primarily open space. Centerville was the main town in Washington Township. Centerville is located at 37°33′15″N 121°59′57″W﻿ / ﻿37.55417, -121.99917. It lies at an elevation of 52 feet (16 m). Centerville was started by George Lloyd who started selling cold beer to stage passengers from a tent in 1850. Capt. George Bond set up a general store and the name Centerville was chosen. The post office opened Centreville post office in 1855 and changed the spelling to Centerville in 1893. The Centerville Pioneer Cemetery contains the burial places of many of the city's founding pioneers. The town is physically divided from other parts of Fremont and neighboring Union City by Mission Boulevard (State Route 238) to the east and north, Alameda Creek to the south, Union Pacific Railroad to the west and southeast, and the Quarry Lakes to the southwest. The hills of Niles are lower than those of the area south of the Alameda Creek in Mission San Jose. Old Town Niles features its own library, post office, and silent movie theater as well as a large number of antique and craft stores. The town is named after Addison Niles. Niles is located at 37°34′44″N 121°58′40″W﻿ / ﻿37.57889, -121.97778﻿ (Niles District). It lies at an elevation of 112 feet (34 m). Part of historic Niles is Mayhew Spring, also known as Mayhew's Sulphur Spring, which was located 600 feet (180 m) north of the Niles railroad depot. The facility was owned by H.A. Meyhew. The coast to coast completion of Transcontinental Railroad is reported to have occurred in nearby Niles Canyon. In September 1869, four months after the famous golden spike ceremony at Promontory Summit, Utah, the Central Pacific Railroad completed the transcontinental rail link between Sacramento and the San Francisco Bay, finishing the track through the canyon. The Central Pacific had acquired the Western Pacific and other local railroads and built track to connect them at a waterfront terminal at Alameda Point. Also part of Niles is Niles Junction on the Western Pacific Railroad, located at 37°34′35″N 121°58′17″W﻿ / ﻿37.57639, -121.97139﻿ (Niles Junction WPRR), and situated at an elevation of 79 feet (24 m). The Irvington District area has cycled through many name changes over time. Shortly after the US Civil war, an emancipated black man traveled from the southern United States to California, reputedly in search of a fortune. The former slave noticed the traffic at the crossroads of what is today the "Five Corners" intersection in Fremont; the transcontinental railroad passed through this region, bringing many passers-by. Realizing a financial opportunity, he constructed the first building at the cross roads, a tavern with an inn known as Dave's Saloon. This corner, today the intersection of Fremont and Washington Boulevards, Union and Bay Streets, is known as "Five Corners" or Irvington Square. Irvington Square's marker, Irvington Plaza park, is located at 37°31′22″N 121°58′18″W﻿ / ﻿37.52278, -121.97167﻿ (Irvington Square). The inn and several of the other original buildings were demolished by the city of Fremont in the early 1980s. Mission San Jose has the highest concentration of Asian Americans in Fremont – over 50% of the population as of the 2000 census. The local high school is Mission San Jose High School, it is ranked 67 in the nation by U.S. News & World Report. The median family income for the Mission San Jose area (ZIP code 94539) exceeded $114,595 in 2005. Owing to an influx of professionals and other affluent families seeking access to the top-performing local public schools, Mission San Jose's median home value reached $831,000 in 2006, earning the community a rank of 237 on Forbes magazine's list of the 500 most affluent communities in the United States. Nestled at the base of Fremont's rolling hills is the Mission San José, one of the oldest of the historic Spanish missions in California, for which this district is named. 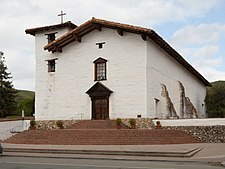 The church building that exists today is a re-construction (dedicated in 1985 for daily Mass and tours) of the original 1809 adobe church that was destroyed by the 1868 Hayward-fault earthquake. One side of the original mission quadrangle remains and houses a museum. Mission San Jose is located at 37°31′59″N 121°55′13″W﻿ / ﻿37.53306, -121.92028﻿ (Mission San Jose); and lies at an elevation of 305 feet (93 m). The Warm Springs district is the southernmost portion of Fremont whose hub is the Warm Springs and Mission Boulevard intersection. It is located at 37°29′14″N 121°55′45″W﻿ / ﻿37.48722, -121.92917, and lies at an elevation of 62 feet (19 m). 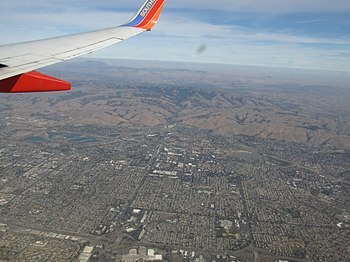 Due to its proximity to the center of Silicon Valley, Warm Springs has attracted the headquarters of many high-tech companies including Nielsen Norman Group, Lam Research, Corsair Memory and Lexar of the US as well as foreign high-tech companies such as Elitegroup Computer Systems, and Asus. The district is also home to blue-collar industry. The San Jose mission is also present. 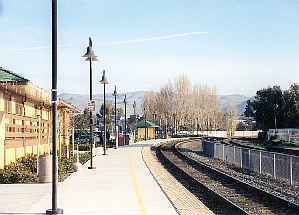 The BART extension to Warm Springs began construction in 2009 and opened for service in 2017. Politically, Fremont leans towards the Democratic Party. There were 73,989 housing units at an average density of 844.5 per square mile (326.1/km²), of which 44,463 (62.6%) were owner-occupied, and 26,541 (37.4%) were occupied by renters. The homeowner vacancy rate was 1.3%; the rental vacancy rate was 4.5%. 136,606 people (63.8% of the population) lived in owner-occupied housing units and 75,832 people (35.4%) lived in rental housing units. In addition, Fremont has a notable concentration of Asian Indians, predominantly employed in Silicon Valley's technology sector. Among the Asian community of Fremont, the largest ethnic groups are Chinese, Indians, and Filipinos. Fremont and nearby Union City have fairly large numbers of Pacific Islanders, Cubans and Puerto Ricans, Spanish and Portuguese, and a small number of American Indians. Companies headquartered in Fremont include Antec Inc, Corsair Memory, Ikanos Communications, Lam Research, Fremont Bank, Nielsen Norman Group, Oplink Communications, SYNNEX, S3 Graphics, Exar, Volterra Semiconductor and DCKAP. Fremont Central Park has 450-acre (1.82 km2) on Paseo Padre Parkway between Grimmer Road and Stevenson Boulevard, easily accessible from I-880 and I-680. It was developed in 1960, and contains Lake Elizabeth an 83-acre (336,000 m2) man-made lake. The lake was dedicated in 1969 to Fremont's former sister city: Elizabeth, South Australia. The Fremont Park Golf Course is northeast of the park, and the Aqua Adventure water park and group picnic areas is southwest of the park. This City of Fremont park is the last remaining 20 acres of the historic California Nursery Company. Once 463 acres, the nursery property extended to Alameda Creek and included land that is now a subdivision and included portions of the Quarry Lakes Regional Recreation Area. The "Niles Rose Garden", at the park entrance, is the former nursery display garden. The garden was filled with flowering bulbs in the spring and roses after the spring show. Today it is filled with roses, heritage and modern. ^ "California Cities by Incorporation Date" (Word). California Association of Local Agency Formation Commissions. Archived from the original on November 3, 2014. https://web.archive.org/web/20141103002921/http://www.calafco.org/docs/Cities_by_incorp_date.doc. Retrieved March 27, 2013. ^ "Comprehensive Annual Financial Report: Fiscal Year Ended June 30, 2013". City of Fremont, California. http://www.fremont.gov/documentcenter/view/21162. Retrieved February 8, 2015. ^ "Mayor & City Council". City of Fremont. http://www.fremont.gov/598/Mayor. Retrieved February 8, 2015. ^ "City of Fremont Official Website — City Manager". http://www.fremont.gov/index.aspx?nid=79. Retrieved March 18, 2013. ^ "Senators". State of California. http://senate.ca.gov/senators. Retrieved March 18, 2013. ^ "Members Assembly". State of California. http://assembly.ca.gov/assemblymembers. Retrieved March 18, 2013. ^ "California's 15th Congressional District - Representatives & District Map". Civic Impulse, LLC. http://www.govtrack.us/congress/members/CA/15. Retrieved March 13, 2013. ^ "2016 U.S. Gazetteer Files". United States Census Bureau. https://www2.census.gov/geo/docs/maps-data/data/gazetteer/2016_Gazetteer/2016_gaz_place_06.txt. Retrieved Jul 19, 2017. ^ "Fremont". Geographic Names Information System, U.S. Geological Survey. http://geonames.usgs.gov/pls/gnispublic/f?p=gnispq:3:::NO::P3_FID:277521. Retrieved February 8, 2015. ^ a b "Demographics". City of Fremont. http://www.fremont.gov/index.aspx?NID=184. Retrieved October 7, 2014. ^ "ZIP Code(tm) Lookup". United States Postal Service. https://tools.usps.com/go/ZipLookupAction!input.action. Retrieved November 23, 2014. ^ a b San Francisco Chronicle, Fremont's Little Kabul eyes election with hope, August 21, 2009. ^ "Alameda County". California Historical Landmarks. State of California Office of Historic Preservation. http://ohp.parks.ca.gov/default.asp?page_id=21388. Retrieved May 6, 2011. ^ "Jill M. Singleton. Lost Wineries and Vineyards of Fremont, California. Fremont Museum of Local History. Accessed 2006-11-09". Museumoflocalhistory.org. http://www.museumoflocalhistory.org/pages/wineries.htm. Retrieved March 18, 2012. ^ a b c d e Dennis, Rob (December 30, 2011). "Fremont mayor Bob Wasserman dead at 77". The Argus (Fremont). http://www.insidebayarea.com/news/ci_19641994. Retrieved January 21, 2012. ^ "FBI raids solar firm Solyndra". The Oregonian. The Associated Press. September 8, 2011. http://www.oregonlive.com/business/index.ssf/2011/09/fbi_raids_solar_firm_solyndra.html. ^ Goossens, Ehren (December 8, 2009). "Solyndra, Solar-Panel Company Visited by Obama, Shuts Down". Businessweek. http://www.businessweek.com/news/2011-08-31/solyndra-to-file-for-bankruptcy-mulls-sale-and-licensing-deals.html. Retrieved September 2, 2011. ^ Durham, David L. (1998). California's Geographic Names: A Gazetteer of Historic and Modern Names of the State. Quill Driver Books. p. 634. ISBN 9781884995149. ^ a b c d e f "Chapter 4: Community Character" (PDF). General Plan 2030 Working Draft. City of Fremont, California. November 2010. http://www.fremont.gov/DocumentView.aspx?DID=4667. Retrieved November 24, 2010. ^ a b c Durham, David L. (1998). California's Geographic Names: A Gazetteer of Historic and Modern Names of the State. Quill Driver Books. p. 615. ISBN 9781884995149. ^ Holmes, Philip. Centerville, Fremont. Images of America. Arcadia Publishing. ISBN 978-0738581774. ^ "History of the Fremont Fire Department". https://www.fremont.gov/DocumentCenter/Home/View/733. Retrieved September 23, 2015. ^ Holmes, Philip (June 24, 2015). "History Column: Centerville Fire Department". Tri-City Voice (Fremont). http://www.tricityvoice.com/articlefiledisplay.php?issue=2014-06-24&file=Centerville+Fire+Dept+-+History+895P+++TCV.txt. Retrieved September 23, 2015. ^ a b c d e f Durham, David L. (1998). California's Geographic Names: A Gazetteer of Historic and Modern Names of the State. Quill Driver Books. p. 672. ISBN 9781884995149. ^ "Archived copy". Archived from the original on 2014-06-27. https://web.archive.org/web/20140627032718/http://www.museumoflocalhistory.org/documents/African-Amer-UnionCity.pdf. Retrieved 2013-09-16. ^ "Fremont | Warrant Search" (in en). https://www.govwarrantsearch.org/california-ca/fremont. ^ Durham, David L. (1998). California's Geographic Names: A Gazetteer of Historic and Modern Names of the State. Quill Driver Books. p. 665. ISBN 9781884995149. ^ "#237 94539". Forbes.com. September 13, 2007. https://www.forbes.com/lists/2007/7/forbeslife-cx_07zip_94539_ZIP94539.html. Retrieved September 9, 2010. ^ Marech, Rona (May 17, 2002). 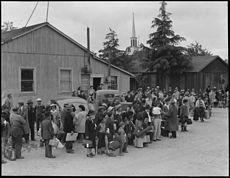 "OF RACE AND PLACE / Little Asia / Fremont community largely made up of immigrants with means". Sfgate.com. http://www.sfgate.com/cgi-bin/article.cgi?file=/chronicle/archive/2002/05/17/EB49066.DTL. Retrieved September 9, 2010. ^ "Immigrants Weigh Splitting from Calif. School System". NPR. https://www.npr.org/templates/story/story.php?storyId=4190129. Retrieved September 9, 2010. ^ a b c d e f Durham, David L. (1998). California's Geographic Names: A Gazetteer of Historic and Modern Names of the State. Quill Driver Books. p. 720. ISBN 9781884995149. ^ Matthew Artz (August 29, 2010). "San Jose Mercury News Entry". Media News Group. http://www.Mercurynews.com/top-stories/ci_15917668?nclick_check=1. Retrieved August 29, 2010. ^ Bronstein, Phil (2010). "Are Bikini Baristas 'Bad Feminists?'". San Francisco Chronicle. http://www.sfgate.com/cgi-bin/blogs/bronstein/detail?entry_id=71196&tsp=1. Retrieved September 7, 2010. ^ "One or Two Lumps in Your Cup?". http://www.nbcbayarea.com/news/local-beat/Would-You-Like-Some-Coffee-With-Your-Eye-Candy-101797983.html. Retrieved 20 April 2018. ^ "Bikini Baristas Lure In Fremont Coffee Drinkers". CBS News. August 30, 2010. Archived from the original on September 1, 2010. https://web.archive.org/web/20100901084428/http://cbs5.com/business/fremont.bikini.barista.2.1887488.html. Retrieved September 7, 2010. ^ "Warm Springs BART link breaks ground in Fremont". October 2, 2009. Archived from the original on August 4, 2016. https://web.archive.org/web/20160804025350/http://www.mercurynews.com/fremont/ci_13470874. Retrieved September 7, 2016. ^ "First day of service at Warm Springs BART brings local visitors". http://www.sfgate.com/bayarea/article/First-day-of-service-at-Warm-Springs-BART-brings-11027899.php. Retrieved 6 April 2017. ^ a b c d e "Chapter 2: Land Use" (PDF). General Plan 2030 Working Draft. City of Fremont, California. November 2010. http://www.fremont.gov/DocumentView.aspx?DID=4665. Retrieved November 24, 2010. ^ "Community Character Maps". http://www.fremont.gov/DocumentCenter/Home/View/6229. Retrieved 20 April 2018. ^ "Data Tools: 1981-2010 Normals". NOAA. January 2016. http://www.ncdc.noaa.gov/cdo-web/datatools/normals. Retrieved January 28, 2016. ^ American FactFinder, United States Census Bureau. "Fremont city, California — Income in the Past 12 Months (In 2007 Inflation-Adjusted Dollars)". Factfinder.census.gov. http://factfinder.census.gov/servlet/STTable?_bm=y&-context=st&-qr_name=ACS_2007_1YR_G00_S1901&-ds_name=ACS_2007_1YR_G00_&-CONTEXT=st&-tree_id=307&-redoLog=false&-_caller=geoselect&-geo_id=16000US0626000&-format=&-_lang=en. Retrieved September 9, 2010. ^ "2010 Census Interactive Population Search: CA - Fremont city". U.S. Census Bureau. https://www.census.gov/2010census/popmap/ipmtext.php?fl=06:0626000. Retrieved July 12, 2014. ^ "Fremont (city), California". State & County QuickFacts. U.S. Census Bureau. Archived from the original on August 21, 2012. https://www.webcitation.org/6A51xDUHn?url=http://quickfacts.census.gov/qfd/states/06/0626000.html. Retrieved April 30, 2012. ^ "California — Race and Hispanic Origin for Selected Cities and Other Places: Earliest Census to 1990". U.S. Census Bureau. Archived from the original on August 6, 2012. https://www.webcitation.org/69hd5KAIE?url=http://www.census.gov/population/www/documentation/twps0076/twps0076.html. Retrieved April 30, 2012. ^ "Demographic Profile Bay Area Census". https://www.census.gov. ^ "City of Fremont, California Comprehensive Annual Financial Report, for the Year ended June 30, 2013". http://www.fremont.gov/DocumentCenter/View/21162. Retrieved October 28, 2014. ^ Hansen, Louis (October 13, 2017). "Tesla fires hundreds after company-wide performance reviewsn". https://www.mercurynews.com/2017/10/13/4819750/. ^ "City of Fremont Official Website — Upcoming Exhibitions". Fremont.gov. http://www.fremont.gov/index.aspx?NID=906. Retrieved March 18, 2012. ^ "Past Exhibits". Olive Hyde Art Guild. http://olivehydeartguild.org/news-events/past-exhibits/. Retrieved March 18, 2012. 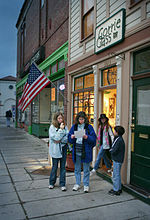 ^ "City of Fremont Official Website — Olive Hyde Art Gallery". Fremont.gov. http://www.fremont.gov/index.aspx?NID=337. Retrieved March 18, 2012. ^ "Olive Hyde Art Gallery". Olive Hyde Art Guild. http://olivehydeartguild.org/about-olive-hyde/olive-hyde-art-gallery/. Retrieved March 18, 2012. ^ "California Nursery Historical Park | City of Fremont Official Website" (in en). https://fremont.gov/2896/California-Nursery-Historical-Park. ^ Pogash, Carol. "Challenge at Mission Peak: Finding a Place to Park". The New York Times Company. https://www.nytimes.com/2014/11/05/us/in-climbing-a-california-peak-the-challenge-is-finding-a-place-to-park.html?ref=us&_r=0. Retrieved November 5, 2014. ^ City of Fremont CAFR Script error. Retrieved August 10, 2009. ^ a b "2014-2015 Alameda County Grand Jury Report". 2015-06-30. pp. 85–92. http://www.acgov.org/grandjury/final2014-2015.pdf. Retrieved 2015-07-08. "The Grand Jury is deeply concerned with Fremont's loose interpretation of California government transparency and retention statutes and the city's apparent intentional efforts to exclude the public from accessing city emails ... The Grand Jury concludes that the city of Fremont's interpretation of California statutes cited in this report is contrary to the spirit of open and transparent government and must be changed." ^ "Grand jury: Fremont defied spirit of transparency with email retention policy". http://www.ebcitizen.com/2015/06/grand-jury-fremont-defied-spirit-of.html. Retrieved 20 April 2018. ^ "Fremont's email retention policy subject of Alameda County Grand Jury report". http://www.dailydemocrat.com/general-news/20150702/fremonts-email-retention-policy-subject-of-alameda-county-grand-jury-report. Retrieved 20 April 2018. ^ "Fremont chastised for destroying emails, Berkeley Mayor Tom Bates needs better audio, sorry Oakland workers". http://www.orovillemr.com/general-news/20150702/fremont-chastised-for-destroying-emails-berkeley-mayor-tom-bates-needs-better-audio-sorry-oakland-workers. Retrieved 20 April 2018. ^ "District-Based Election System". https://fremont.gov/districtelections. Retrieved July 9, 2017. ^ a b c Geha, Joseph (June 7, 2017). "Council picks city’s first district voting map". http://www.eastbaytimes.com/2017/06/07/fremont-council-picks-district-voting-map-with-political-overtones/. Retrieved July 9, 2017. ^ "City of Fremont Plan C-2b 5-22-17 Council Districts". June 13, 2017. https://fremont.gov/DocumentCenter/View/35312. Retrieved July 9, 2017. ^ Geha, Joseph (March 23, 2017). "Fremont to switch to district-based election system". http://www.eastbaytimes.com/2017/03/23/fremont-to-switch-to-district-based-election-system/. Retrieved September 10, 2017. ^ Merl, Jean (September 14, 2013). "Voting Rights Act leading California cities to dump at-large elections". http://www.latimes.com/local/la-me-local-elections-20130915-story.html. Retrieved September 10, 2017. ^ "Tak Fudenna Stadium". Aedisgroup.com. http://www.aedisgroup.com/tak_fudenna_stadium.html. Retrieved March 18, 2012. ^ "Library Administration Script error." Alameda County Library. Retrieved on April 1, 2010. ^ "BART to Berryessa, Milpitas may not happen until late 2019". https://www.mercurynews.com/2018/06/11/bart-to-milpitas-berryessa-may-not-happen-until-late-2019/. ^ "Dumbarton Rail Corridor". San Mateo County Transportation Authority. http://www.smcta.com/Dumbarton_Rail/information.asp. Retrieved January 24, 2007. ^ "Channel Vision". Goldsea. 1997. http://goldsea.com/WW/Liangchristine/liangchristine.html. Retrieved 18 November 2015. ^ City of Fremont. "Sister Cities". About Fremont. Archived from the original on June 23, 2009. https://web.archive.org/web/20090623095437/http://www.fremont.gov/index.aspx?NID=152. Retrieved October 5, 2008. This page uses content from the English language Wikipedia. The original content was at Fremont, California. The list of authors can be seen in the page history. As with this Familypedia wiki, the content of Wikipedia is available under the Creative Commons License.